A Bordeaux legend: a majestic, concentrated, voluptuous, supple wine. Very few great red wines are made exclusively from Merlot. However, in this unique terroir, the grape produces an incompably velvety wine with incredible concentration. It is quite simply majestic, presenting unequalled power and richness; some vintages can be kept for more than fifty years. Despite being unclassified, like all of Pomerol's properties, Petrus is the most famous and the most prestigious of all of its wines. The legend of Petrus began at the end of the 19th century. The Arnaud family owned the vineyard and Petrus was already enjoying a reputation that was only ever going to get better. From 1925, Edmonde Loubat gradually bought shares in the family company, the Société Civile du Château Petrus. She became the sole proprietor in 1945. Dynamic and aware of the exceptional potential of this little vineyard (then about 6.5 ha, it has since grown to 11.5 after the purchase of a plot from Château Gazin), she found the ideal partner in 1947 in Jean-Pierre Moueix, a wine merchant in Libourne originally from Corrèze in central France. Year on year, the domaine's renown continued to grow.Together they made a very talented team and raised the property to extraordinary heights from the beginning of the 1950s. Well-known in France but enjoying legendary status abroad, Petrus was served at Elizabeth II's engagement party. In the 1960s, President Kennedy displayed a particular fondness for Petrus, indirectly contributing to its popularity in the United States and bestowing on it the status of one of the world's truly great wines. It was also at this time that Jean-Pierre Moueix began to get involved in the vinification process. 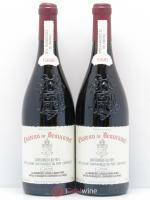 He bought half the domaine in 1964, and the rest in 1972, leaving it to his son Jean-François. Few Bordeaux families have been as influential as the Moueix, who own nine other properties in Pomerol, including Château Trotanoy and Château La Fleur-Pétrus. This domaine enjoys a terroir which is without equal anywhere in Bordeaux: the soil consists almost exclusively of black clay, rising to a mound which tops out at a height of 40 metres. This is ideal soil for Merlot, which accounts for nearly 96% of the vines. The remaining 4% are Cabernet Franc, very little of which finds its way into the final blend. Petrus produces only grand vin (the remainder of the production being declassified), and obviously no white. The harvests are manual and the wines are aged for an average of 20 months (in 100% new barrels). The 1947 Petrus is the most decadent "wine of the century." While not as port-like as the 1947 Cheval Blanc, it is a massive, unctuously-textured, viscous wine with amazing power, richness, and sweet fruit. The nose explodes from the glass, offering jammy fruit, smoke, and buttery caramel scents. The wine's viscosity is reminiscent of 10-W-40 motor oil. It is so sweet, thick, and rich one suspects a spoon could stand upright. The wine is loaded with dream-like quantities of fruit, as well as high alcohol, but there is no noticeable tannin. While drinkable now, given its amazing fruit extract, and high levels of glycerin and alcohol, it is capable of lasting two more decades.